There are two main categories of eyelid tumors which are benign tumors and cancerous or malignant tumors. A papilloma is a benign growth that can occur on the eyelids and are much more common as we age. They need no treatment unless they are on the upper lid and drooping over the vision or from a cosmetic standpoint the person wants it removed. These can just look like an eyelid bump and can begin to drain a discharge. These can be easily treated or removed. Small growth on eyelid which can look like a small cylinder or sausage-shaped piece of skin with a small base at the surface of the skin is a skin tag. The skin tag on eyelid can easily be removed if the person desires. This is a growth that has the appearance of a horn growing on the skin. These need to be removed and sent for pathology as a percentage of these lesions may have a cancerous lesion at the base of the cutaneous horn. Basal cell carcinomas comprise more than ninety percent of skin cancers. This cancer is derived from the epithelial basal cell layer of the skin. They occur on the lower eyelids more than seventy five percent of the time. This is more likely due to the fact that the lower eyelid receives more sun exposure. The appearance can vary. These eyelid tumors typically have a nodular shape with a waxy surface. They may spontaneously bleed slightly and form a scape which can intermittently fall off. Basal cell carcinomas do not spread to other organs, lymph nodes, or other parts of the body. Squamous cell carcinoma is much less common but is more aggressive. Squamous cell carcinoma can metastasize to other parts of the body. Sebaceous gland carcinoma is a very uncommon malignant tumor arising from sebaceous glands. This tumor most involves the eyelids in the meibomian glands or Zeis glands of the eyelashes. This is an aggressive tumor and is potentially lethal. It occurs more commonly on the upper eyelid. It can mimic a Chalazion on the eyelid. 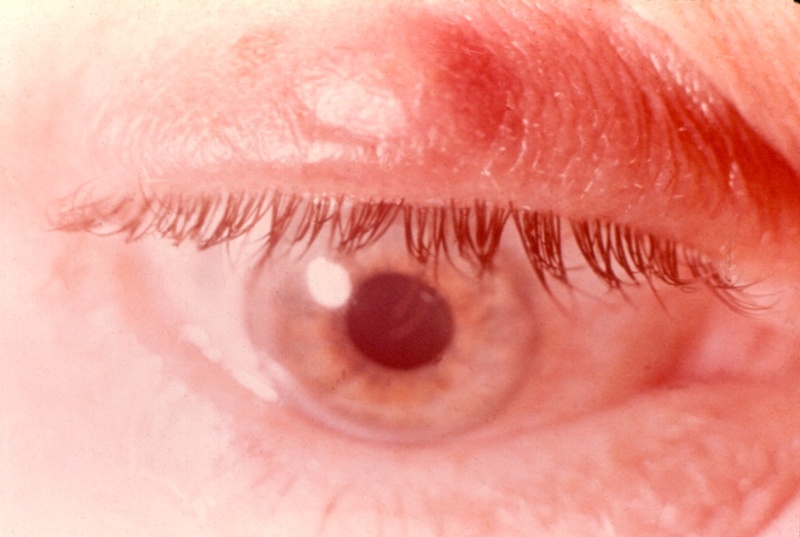 If a person has a reoccurring chalazion, an atypical presentation of a chalazion, or the lesion is unresponsive to treatment, then a sebaceous gland carcinoma should be considered. The lesion should be biopsied. 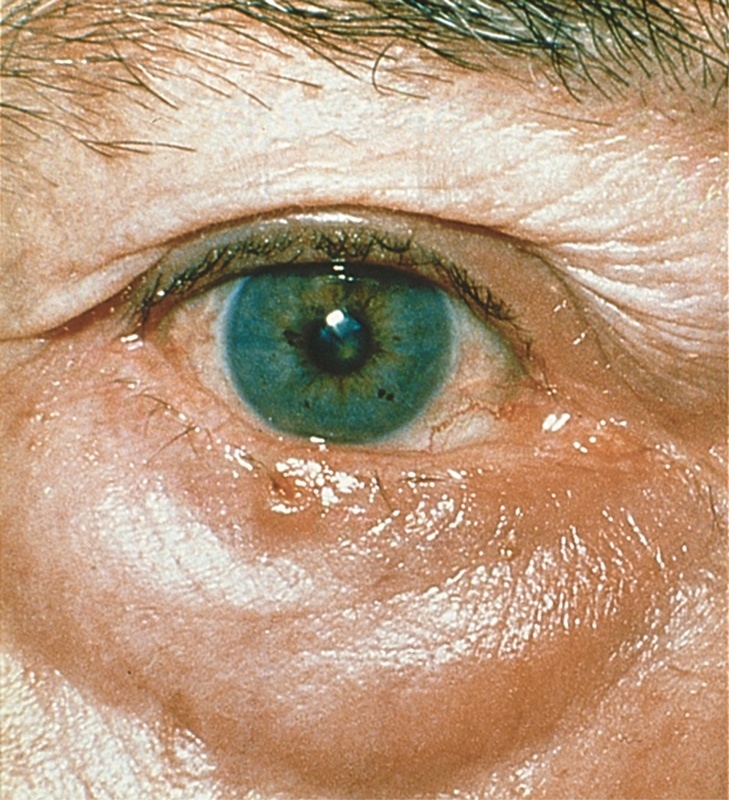 Melanomas can rarely occur on the eyelids. This is also a very aggressive tumor and can be lethal. If a person has an unusual pigmented lesion on their eyelid, they should have it examined by an eye doctor to see if it needs to be biopsied. If you have a growth that is developing on your eyelid, it is important for you to see your eye doctor. Depending of the appearance, your eye surgeon may recommend biopsy and/or removal.